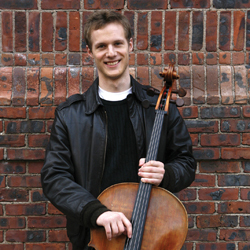 Praised by The Strad for his “…powerfully expressive style,” cellist Sebastian Bäverstam is a winner of the 2009 Concert Artists Guild International Competition. His recent performance at Weill Recital Hall at Carnegie Hall was noted in The Strad for its“consummate instrumental mastery,” with critic Dennis Rooney declaring “…the emergence of a mature artist.” This remarkable recital led to Mr. Bäverstam’s subsequent selection by Musical America as its “New Artist of the Month” for June 2011. Highlights of 2012-13 include his season-opening recital for the Bennett Gordon Hall Classics series of the Ravinia Festival, where he also spends the summer of 2012 as a member of Ravinia’s renowned Steans Institute. His cross-country recital tours encompass eighteen concerts in thirteen different states, including performances for the Pepperdine University Center for the Arts and the Chamber Music Society of Little Rock. Featured concerto performances include the Dupage (IL) and Mankato (MN) Symphony Orchestras (both Strauss Don Quixote) and the South Bay Symphony in Myrtle Beach, SC (Saint-Saëns Concerto No. 1). Sebastian Bäverstam, age twenty-three, has appeared multiple times on the nationally syndicated radio show From the Top, and he has also been heard on international radio broadcasts on Voice of America. On television, he was featured on the PBS TV version ofFrom the Top, and he has participated in a PBS documentary filmed at Carnegie Hall, as well as a film by the Masterclass Media Foundation of Great Britain and a nationally televised commercial for Bose speakers. Other recent concerto performances include the Albany Symphony Orchestra, Symphony of Northwest Arkansas, Boston Landmarks Orchestra University of Chicago Symphony, Boston Civic Symphony, Brockton Symphony Orchestra, Concord Symphony Orchestra and the Chernikov Symphony Orchestra, among others, and he has toured China, Venezuela and Brazil as soloist with the New England Conservatory Youth Philharmonic Orchestra. Other recent recital highlights are Merkin Concert Hall, St. Vincent College (PA), the Honest Brook Music Festival (Delhi, NY), as well as concerts in New York, Boston, Connecticut and Switzerland. Committed to performing music of our time and to working with living composers, Mr. Bäverstam was the 2006 winner for contemporary interpretation at the Johansen International Competition for String Players. He has attended many summer festivals including the Aspen Festival, the Banff Centre in Canada, the Verbier Festival Academy and the International Music Academy of Switzerland, directed by Seiji Ozawa. Mr. Bäverstam offered his first full recital at the age of six at Harvard University and his first concerto with orchestra at the age of seven. In 2002 at the age of fourteen, he made his Weill Hall debut. Since then he has given numerous solo recitals, recently performing all six Bach cello suites at Williams College. He appeared as the featured young artist of the 2005 Williamstown Chamber Concerts and has also performed at the Cape Cod Chamber Music Festival, the ASCAP awards at Lincoln Center, the Théatre des Champs Elysées in Paris and many other venues. Additional recognition includes the 2006 Harvard Music Association Young Artist Award, the New England Chamber Music Foundation Award in 2004, first place in the 2002-2003 and the 2000-2001 New England Conservatory Preparatory School Concerto Competitions, the 2002 Suzuki Association of America and the International Young Virtuoso Competition of 2001-2002. A dual citizen of the United States and Sweden, Sebastian Bäverstam has participated in master classes with Frans Helmerson, Orlando Cole, Pieter Wispelwey, and Bernard Greenhouse, among others, and he currently studies with Paul Katz at the New England Conservatory in Boston.